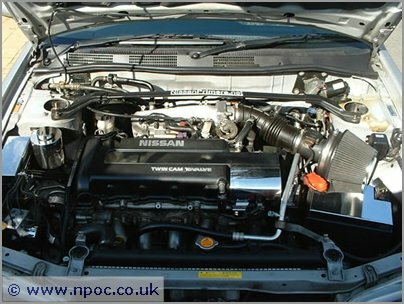 From this month we are starting to do a new front page feature on a members car. 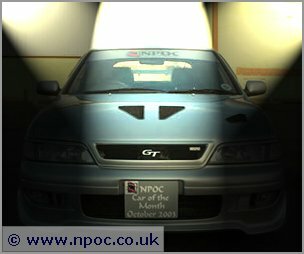 If your car is chosen as the NPOC Car of the Month you will receive absolutely no prize whatsoever (!) But you will earn the respect of the 1000's of people who visit this site everyday! 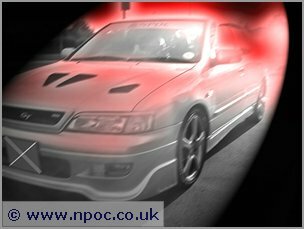 The first NPOC Car of the Month belongs to David Evans (davidevans007). David is 29, lives with Lena in South Wales and owns a 1999 P11 Primera GT Hatchback in Silver. So Dave, thanks for agreeing to be the first NPOC Car of the Month! Maybe we could start with finding out what you do in "real life" mate? "I work for the Defence Aviation Repair Agency, who are within the Ministry of Defence, as an electrician. I install/test and fix all the electrical systems on the Tornado F3"
Ok! So tell us how you came to own your P11 GT? "Well, I bought the car in August 2002 for £5995. How, is a long story! It all started in 1997 with a burgundy coloured P11 GX that I hired from Avis (I still have the rental receipt) to get me up to Scotland one weekend. I couldn't believe how comfortable it was and for a 1.6 it easily sat at 100mph and some, up the motorways! 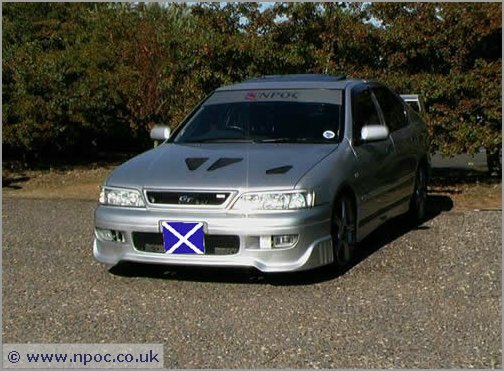 Well that made me start looking at getting rid of my heavily modified pocket rocket AX GT." AX as in Citroen, I presume? "Yeah, it was a limited edition GT5 (5 door) with 125bhp, it was my first major spending spree on cars, re-sprays, engine, suspension, lighting, bodywork, interior, ice, in the end I'd changed just about everything on that too! 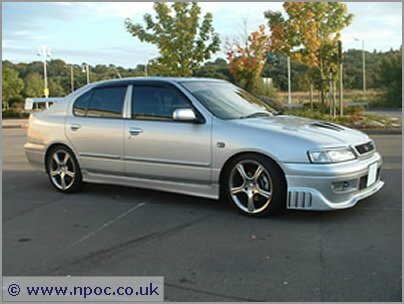 I'd spent roughly about £10,000 on modifications"
"Well, the first Primera I owned was a red coloured Si which I bought in 1998. I wanted the GT but there was no way I was prepared to pay the insurance premiums! The Si was modified like no other Si (back then) and because of that and the 134,000 miles on the clock, it was forever in the Dealers getting broken bits replaced. Then, after one visit and two new driveshafts, a gearbox, a clutch and a bill coming up for £1000, I said that's enough and started looking for the GT." So would you actually describe your first ownership of a Primera a bad one, or did you accept it was down to being over modified? "Oh no, the Si was a great car, it made it up to about 100,000 miles before major things started to go wrong (I'd do a 1000 mile round trip from Wales to Scotland just about every weekend). It was definitely down to over modified and over driven, like most 1.6 owners I pushed it so hard most people thought it was a 2.0 !. 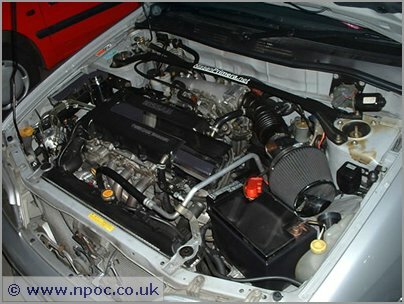 I used to talk to a few of the original Primera owners (NismoGT, Ragt20, P11GT etc) on another forum before this one started, telling them of all the problems week after week I had with the car, all they would say is get rid and get a GT, so I did!" Ok, so then the GT search was on? "Yeah, I found one at a garage down the road, I knew it wouldn't stay for sale long, so by the end of the day I had part exchanged the Si for £1500 and signed up for the new (standard) car." Right! We now own a GT. 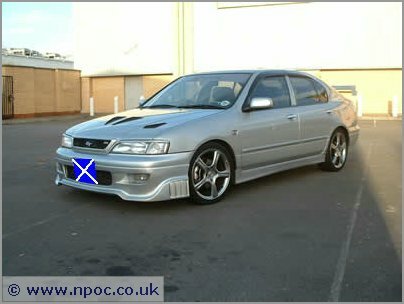 It is standard, and the last car you had, modified, gave you lots of problems! So how did your gorgeous GT become what it is today? "Well I've been into modifying cars since I passed my test and got my first car, every one has had something different about it! But you are right, I told everyone I wouldn't be modifying this one because of all the money I'd spent and the problems I had had with the old Si! That lasted until Lena offered to buy me a set of wheels for my birthday last year, and it then continued from there." A lady that can't complain you spend money on your car, when she actually tempted you in the first place then! What came next? 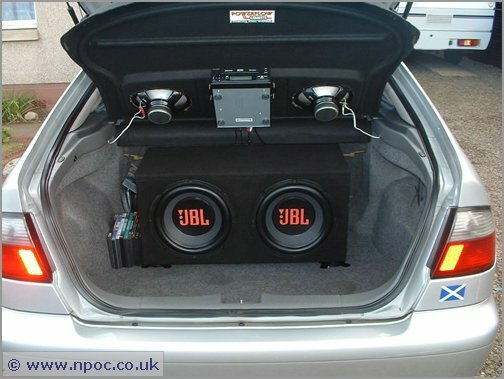 "I did actually take the clear rears and the side repeaters off the old Si, and I put these on the day I picked up the GT. That meant officially they were the first mods! I also swapped all the ICE out of the Si too. Then it was exhaust, suspension, windows, induction, bodywork, cinema, more exhaust, more body mods, shiney bits in the engine bay and so on." So was that the order you worked in, and if so any reason why? "Yeah pretty much. But no reason, just whatever came up or took my fancy at the time." Would you mind giving us a rough estimate of cost and time spent? "You must be looking at least £5000 on the mods and it has all been done in the last twelve months." And your easiest and hardest jobs? "Changing the aerial on the roof to a metal Halfords one was the easiest. As for the hardest I haven't really had one to do myself! If I know there is going to be a problem I get a professional to do it for me. 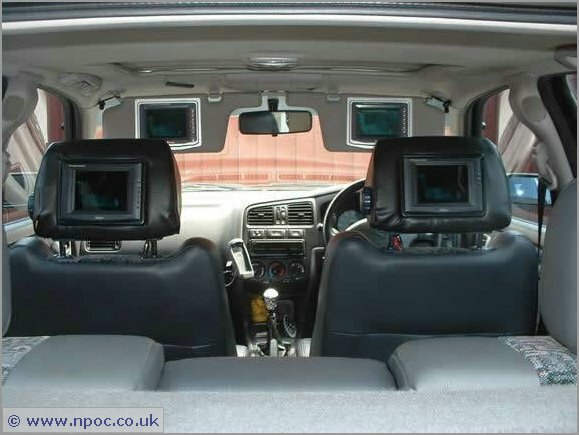 Some have said that installing all the screens must have been a right pain to do! But actually I'm the sort that loves a challenge so it was a real joy in the end." What about your best performance mod and best cosmetic mod? "Well considering all the problems I had with them, the best performance mod I've got on has to be the stainless manifold from Tube Torque! It does exactly what it is supposed to do, it's just a shame it had all the 'extras' with it. 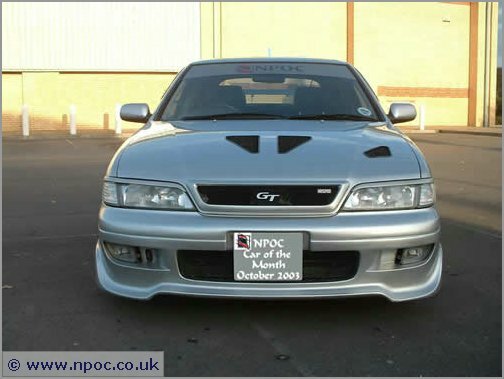 As for the best cosmetic mod, it has to be the 'Scoop of the Century' stillen bumper, nismo grill and bonnet (bought later) off Kev Shek, it was bought off the forum before others had the chance to read the post! It was even the same colour! It has totally transformed the front of the car. 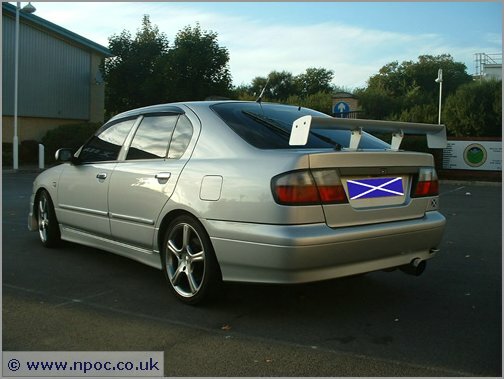 I must also mention the e-tech spoiler that was fitted in one day (including welding the old spoiler holes and spraying the boot lid) by a garage recommended to me by Mick." Well thanks for talking to us Dave, it has been cool getting to know a bit more about you and the P11. Before I leave you in peace, two final questions. Could you tell us your most satisfying mod and also what's next. More mods or new car!!!!!! "Well my most satisfying mod has to be the DVD system. I love seeing people's faces when I tell them it only cost £600 for the lot! But to be honest, all the work on the car makes me smile every time I see it. As for new mods.........."
Well dudes enjoy the pics, and see you next month with the next NPOC Car of the Month.